During operation transformer oil is exposed to a variety of adverse factors: high temperatures, oxygen, moisture, sunlight, and others. Their overall impact leads to a significant deterioration of the insulating properties of transformer oil. It is moment when you need industrial purification systems. In order to preserve and extend service life of electrical equipment it is recommended to periodically monitor its operational parameters. Service life of solid insulation of power transformers depends on the degree of polymerization of cellulose. Its destruction most often occurs in an acidic environment, and the intensity of destruction develops along with increasing operating temperature of the equipment. It follows herefrom that service life of solid insulation is directly dependent on the degree of degradation of transformer oil and its operating temperature. Interestingly, but even in the case of compliance with the existing standards for the acid number there still can be sludge detected in transformer oil, which precipitates in the form of a thin coating on the windings, absorbs into paper and impairs heat removal from the hot parts of the transformer. This also reduces the degree of polymerization of cellulose, and shortens service life of the equipment. If the operational parameters of transformer oil fall below the rated values, this indicates that the oil can not perform the required functions in full, and thus becomes waste. As of today, there is still a tradition that provides for replacement of waste oil with fresh. But, despite the fact that the practice of replacing has been evolving for decades, now the technology of reclamation (regeneration) of transformer oil is getting increasingly used. Let’s try to figure out which decision is more practicable: replacement or regeneration? The major difference between these processes is that the structural-group composition of the regenerated and new oil is not the same even in the case if the oil brands coincide. Over the years of exploitation, oil and paper form a certain kind of symbiosis. Used oil that has passed through the regeneration process stays neutral to the paper that it has been interacting with before. However, if a new oil is filled into the transformer, then, in this case, additional adverse reactions and disruption of the previously achieved equilibrium are possible. Generally, regeneration of used transformer oil is implies the full restoration of its operational parameters to the rated values. From the technical standpoint, this procedure can be performed by the GlobeCore CMM-R regeneration unit. The process of removing undesirable components is carried out through Fuller’s earth sorbent, the properties of which are recovered during the regeneration cycle. Such an approach makes processing of transformer oil continuous and without pauses on replacement of the sorbent. Another important advantage of the CMM-R unit – the ability to regenerate oil directly in the tank of a transformer that is being energized. There is no need in power outage of important objects and civilian users. You shouldn’t forget about the financial aspect as well, because in the light of the current economic situation it is also very important! 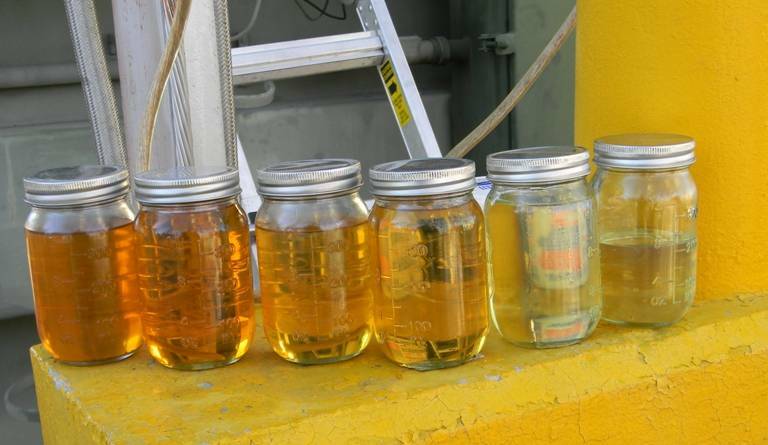 Reclamation of used transformer oil will significantly reduce the costs on purchase of fresh and disposal of waste oil. Moreover, by using the GlobeCore Regeneration Process, you will make an important contribution to the preservation of nature, since waste oil is considered to be quite a hazardous and hard-to-degrade waste.